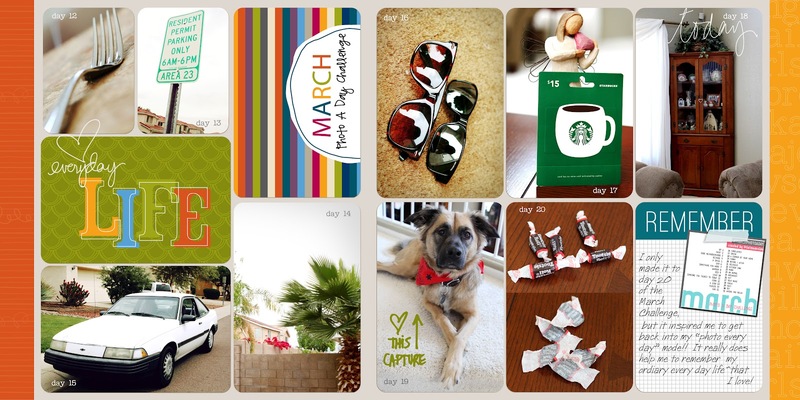 Here is the second page of my "March Photo A Day" for my PL album. Unfortunately I stopped on day 20 of the challenge. 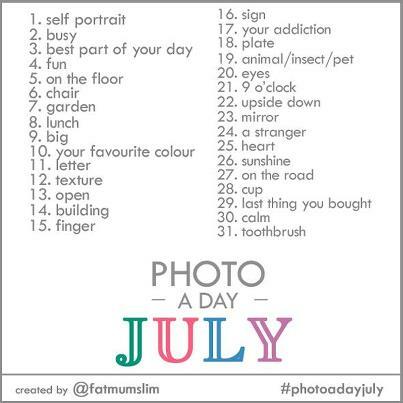 I hope that I will be inspired to keep up and finish the July Challenge!! You can find the challenge HERE. Q: How do I add memorabilia to my digital pages? A: I have not had any to add yet, but when I do, I will scan the tickets/receipts/etc into a folder on my computer, then edit in Photoshop if needed, then just insert the item the same way I would a photo. Q: Where do you get your pages printed? A: I have not had any of my PL pages printed yet, but I will most likely use Costco. They do a great job and are very reasonably priced. I have heard Persnickety Prints does a really nice job as well. 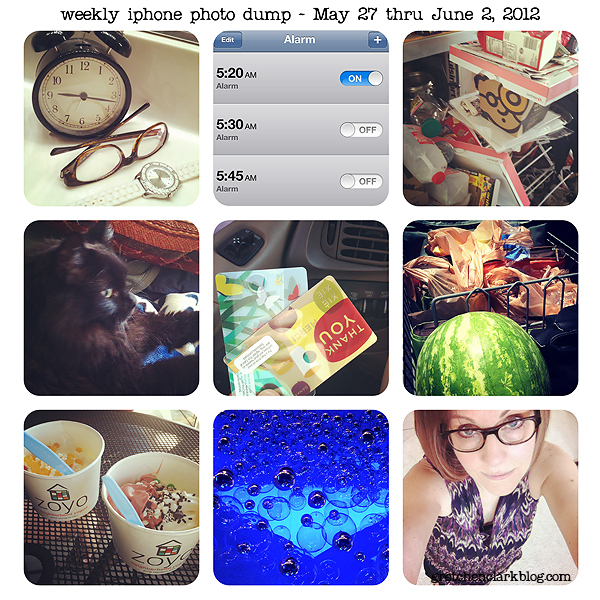 I am also going to print my "weekly iphone dumps" and add them to my album. I always make them in 12 x 12 size, so they will fit in perfectly. I hope you are having a great week!! I was able to complete a couple more Project Life pages on Sunday afternoon. Here is one from back in March, when I took on the Photo A Day Challenge. 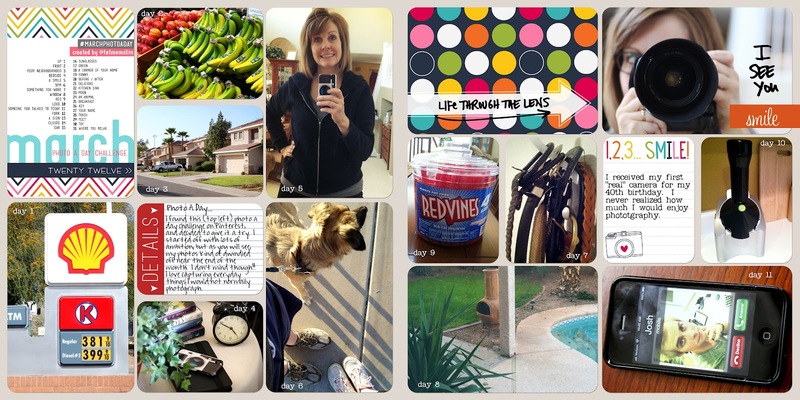 I really am digging the digital version of Project Life, it is so easy for me just to plug my photos into the templates and get my pages done. 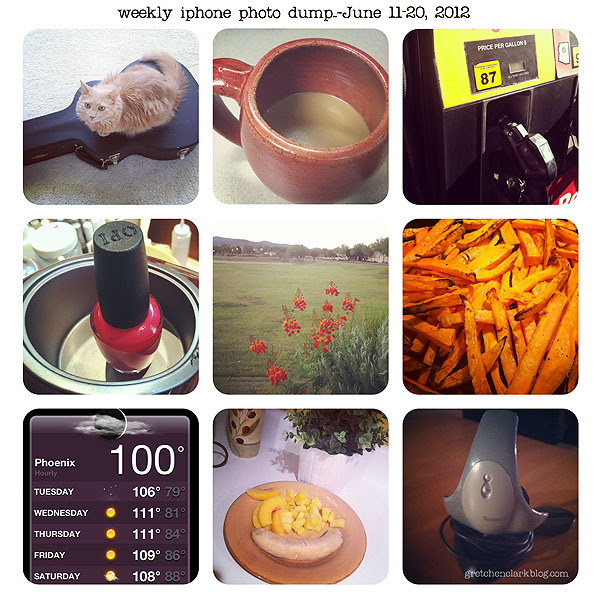 I am going to try my hardest to keep up with the July Photo A Day Challenge. I love that it helps me photograph random things that I normally wouldn't think about taking pictures of. And it makes for a fun scrapbook page!! 1. I wore a dress to work on Thursday~that was something to photograph, LOL!! 2. Josh is in CT this week, so I texted him this picture of Kodi to let him know that his doggie misses him. Don't worry, I am taking very good care of the Kode-Miester!! 4. I treated myself to some non-dairy frozen yogurt on Friday~YUMMY!! 5. Finally decided on a purse. 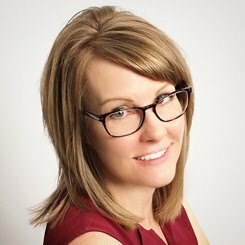 If you are friends with me on Facebook, you might have remembered my husband posting (a million pictures) about me trying to find one a couple of weeks ago. 6. Chipolte for Saturday lunch. What more can I say? I LOVE that place!! 7. Crazy Pete sleeps like this a lot. I guess he likes to stretch out his front paws. 8. A friend from church introduced me to this drink~apparently they don't have it in AZ, BOO!! Because it is soooo good!! Oh where is my blogging mojo??? I hope it returns soon!! I do need to whip up a few cards and have a couple Project Life pages in the works...so hopefully soon I will be back to regularly scheduled blogging!! 1. Crazy Pete likes to be on top of whatever you are doing!! I think he wanted Josh's attention, LOL!! 3. Mike usually gases up my vehicle, but occasionally I have to do it. 4. Ashley and I got a pedi on Friday night after work. We tried out a new place that was pretty nice. I especially liked that the guy at the desk asked if I wanted to sit next to my sister!! 5. I took Kodi for a walk on Sunday evening, and enjoyed the view. 6. Made roasted sweet potato fries for dinner the other night, I could have eaten the entire pan~so YUMMY!! 7. It's starting to get HOT!! 8. My favorite Yonana's combo: banana, peaches and pineapple = DELISH!! 9. Calibrated my computer monitors, cause things have been looking wonky!! ETA: Just realized that I was a week ahead of myself, LOL!! Fixed it!! 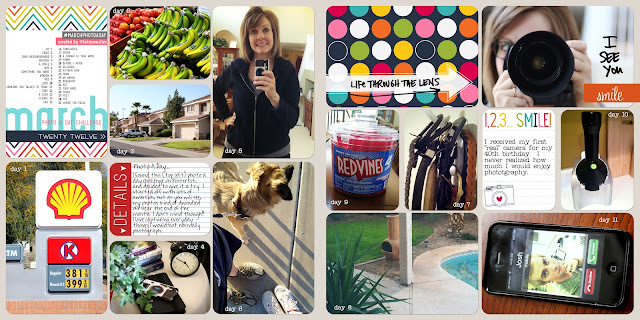 I think I lost my blogging mojo the last few weeks, LOL!! Sorry for the lack of consistent posting, I hope to get back on track soon!! 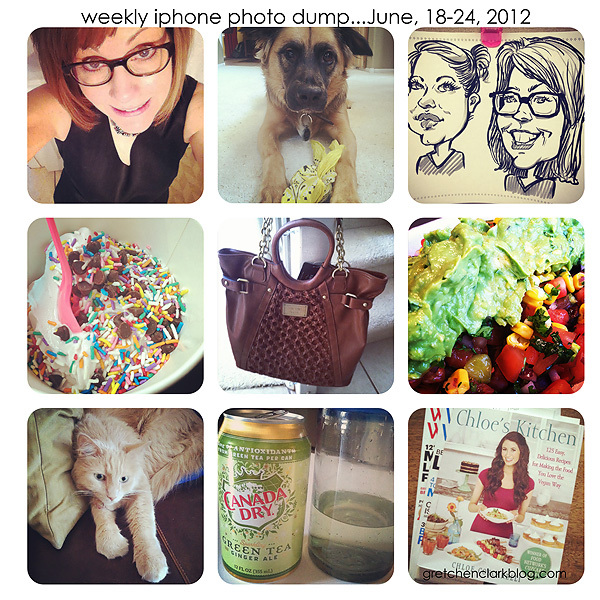 I did however keep up with my random iPhone photo taking (it's an addiction!!). 1. Mike and I went to Sam's Club to stock up (we were way over due, and running out of everything!! ), it is so nice to have that done and put away!! 2. This is my weekend breakfast: English muffin with PB&J so YUMMY!! 3. The Hersh came to stay with us for the weekend (Ashley & Nate had a mini stay-cation in Scottsdale). He was my little shadow all weekend, LOL!! 4. Bought a new purse, but not sure I am totally in love with it just yet. Letting it grow on me, before I fill'er up!! 5. I LOVE watermelon!! I buy one every week and cut it up for a snack (it is already half gone!!). 6. My usual Sunday morning SB's splurge!! 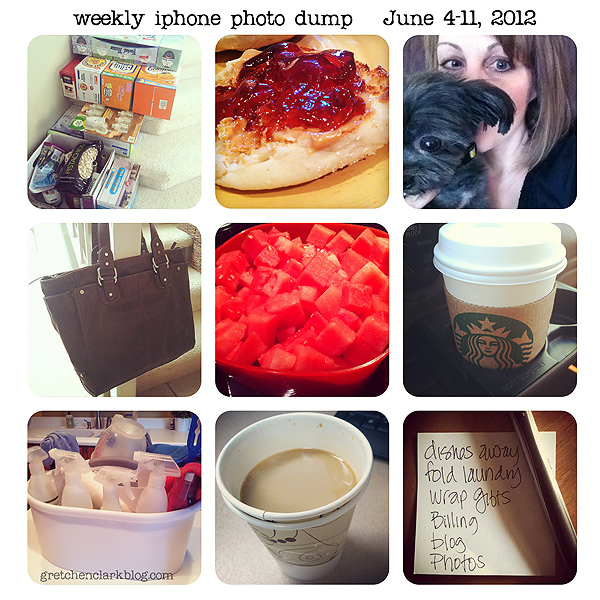 This week it was a skinny Carmel Macchiato. 7. I put off my cleaning until Sunday...I hate when I procrastinate!! 8. My work coffee is really good!! Which is a good and bad thing. Good because I like drinking coffee, bad because I drink way more than I probably should!! 9. Made a quick to-do list of all the things I procrastinated on this weekend, see #7, that must get done TODAY!! I am off to finish up the last few things on my list, see #9.